SAN FRANCISCO, CA--(Marketwire - Feb 13, 2012) - According to eMarketer, by 2015 advertisers will spend $132.1 billion annually for online advertising. Advertisers are increasing their investment in online advertising across multiple channels to drive greater lead generation, customer acquisition, and revenue. This activity is fueling the expanding adoption of Marin Software's ad management and optimization platform. During the last year, Marin nearly doubled its customer base to 1,500 as well as the amount of annual spend managed on its platform to $3.5 billion. In the wake of Marin's success, Asia investment company Temasek led a $30 million round of funding along with SAP Ventures. Joining the new investors in this oversubscribed round were existing Marin venture investors Benchmark Capital, Crosslink Capital, DAG Ventures, and Triangle Peak Partners. Following Marin Software's year of rapid international expansion, customer growth, and product innovation, and the closing of the recent financing, Frank van Veenendaal, President of Worldwide Sales and Services at salesforce.com, has joined Marin Software's Board of Directors. Since its inception in 2006, Marin Software has grown into the premier provider of advertising management solutions worldwide. Marin currently serves clients in 160 countries with 25 currencies, increasing its international footprint in the last year with the opening of offices in Singapore, France, Australia, and Germany. More than 1,500 of the world's leading advertisers and agencies manage $3.5 billion in annualized online ad spend through Marin Software. Within the last few months, Hotels.com, Brookstone, Coupons Inc., Rosetta, and Reprise Media have selected Marin's platform to manage their search, display and social advertising campaigns. Longstanding Marin customers include iProspect, Neo@Ogilvy, Razorfish, Macy's, Experian, and University of Phoenix. Spurred by increasing demand for its products worldwide, Marin Software hired more than 100 new employees during 2011. To date, Marin Software has raised more than $80 million in venture funding. Marin plans to invest this new capital to bolster product development, customer support, and service delivery worldwide. Temasek is an Asia investment company headquartered in Singapore, with a diversified S$193 billion portfolio as of March 31, 2011, concentrated principally in Singapore, Asia and growth markets. Through its partnership with Temasek, Marin Software will be able to accelerate its growth across Asia and other emerging markets. With the investment from SAP Ventures, which is affiliated with SAP AG, the market leader in enterprise application software, Marin Software will have the opportunity to leverage the experience and resources of SAP and its extensive ecosystem to help further Marin's business momentum. Attracted by Marin Software's exceptional growth and industry leadership, Frank van Veenendaal, President of Worldwide Sales and Services at salesforce.com, has joined the Marin Software Board of Directors. Van Veenendaal joined salesforce.com when it had less than $20 million in annual revenue and has since led salesforce.com to its current annual sales run rate of more than $2.3 billion. van Veenendaal's extensive experience will prove invaluable as Marin expands its global sales and services programs. Marin Software's Board of Directors includes Chris Lien, Founder and CEO of Marin Software; Paul Auvil, CFO at Proofpoint, Inc.; Bruce Dunlevie, General Partner at Benchmark Capital; and Donald Hutchison, advisor and investor. "I am pleased to welcome Temasek and SAP Ventures as investors in Marin Software," said Christopher Lien, Founder and CEO of Marin Software. "Temasek brings unrivalled experience and capabilities in Asian and emerging markets, which will benefit Marin's international development. Support from SAP Ventures and relationships with the SAP global ecosystem will further accelerate Marin's growth around the world." "We are honored to have Frank van Veenendaal join Marin's Board of Directors, as he has written the global playbook on world-class SaaS sales and services execution during his tenure at salesforce.com," said Lien. "The entire Marin team looks forward to benefiting from his expertise and counsel as we further develop Marin's position as the global leader in online advertising management." "Marin Software has built incredible momentum in a short amount of time to become a leading provider of ad management solutions, helping advertisers and agencies wring more ROI out of every ad buy," said Frank van Veenendaal, President of Worldwide Sales and Services at salesforce.com. "The traction Marin has gained in the global marketplace reminds me of the early days of salesforce.com, and I look forward to working hand-in-hand with the executive team as the company cements its leadership worldwide." Incorporated in 1974, Temasek is an Asia investment company headquartered in Singapore. Supported by 12 affiliates and offices in Asia and Latin America, Temasek owns a diversified S$193 billion portfolio as at 31 March 2011, concentrated principally in Singapore, Asia and growth markets. Temasek's investment themes centre on Transforming Economies, Growing Middle Income Populations, Deepening Comparative Advantages and Emerging Champions. Its portfolio covers a broad spectrum of industries: financial services; transportation & industrials; telecommunications, media & technology; life sciences, consumer & real estate; energy & resources. Total shareholder return for Temasek since its inception in 1974 has been a healthy 17% compounded annually. It has a corporate credit rating of AAA/Aaa from rating agencies Standard & Poor's and Moody's respectively. For further information on Temasek, please visit www.temasek.com.sg. SAP Ventures is an independent investment firm affiliated with SAP AG (NYSE: SAP), the global market leader in enterprise application software, and we leverage our relationships with SAP and its global ecosystem for the benefit of portfolio companies. We make growth equity and later-stage investments in market-leading technology companies across North America, Europe, and key emerging markets. Over the last 15 years, SAP Ventures has supported more than 100 companies across five continents. Past investments include Commerce One, Endeca, Greenplum, MySQL, Red Hat, and WebEx. Current portfolio companies include Alfresco, Alteryx, Control4, LinkedIn, Lithium, OnDeck, OpenX, SAVO, Spring Wireless, Tealeaf, Tremor Media, and Zend. For more information on SAP Ventures, please visit www.sapventures.com. Marin Software is a leading provider of online advertising management solutions, offering an integrated platform for managing search, social, display, and mobile marketing. The company provides solutions for advertisers and agencies, enabling them to improve financial performance, save time, and make better decisions. Marin Enterprise, the company's flagship product, addresses the needs of online marketers spending at least $100,000 per month on biddable media. Marin Professional delivers the same power and ease of use as Marin Enterprise, through an application designed for marketers spending less than $100,000 per month. Headquartered in San Francisco, with offices worldwide, Marin's technology powers marketing campaigns for over 1,500 customers managing more than $3.5 billion of annualized ad spend in more than 160 countries. For more information, please visit: http://www.marinsoftware.com. 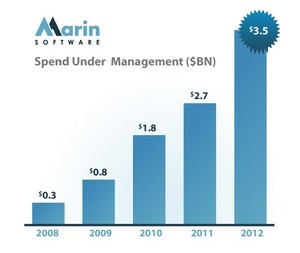 Growth of annualized ad spend managed through Marin Software.